I love how Cromwell says he’s never lost an argument. Is he serious or is it a joke gone flat? Maybe the interviewer “smeared” him by quoting out of context. As one of the “unimportant” people, thanks for your post. I should add to the above that I edited the excerpts very slightly (with the author’s permission) – just to give a more readable flow from one chunk to the next. A few of the links from the original article were expired (eg the one to the edipemiological research centre) so I’ve updated those. Encouraging to see a lot of hits already this morning. It’s an excellent article, but remember that a lot of people will always see IBC as the group that provided the estimate that was ‘too low’ (because they only counted documented deaths, and necessarily omitted the unreported ones – as they themselves acknowledge). 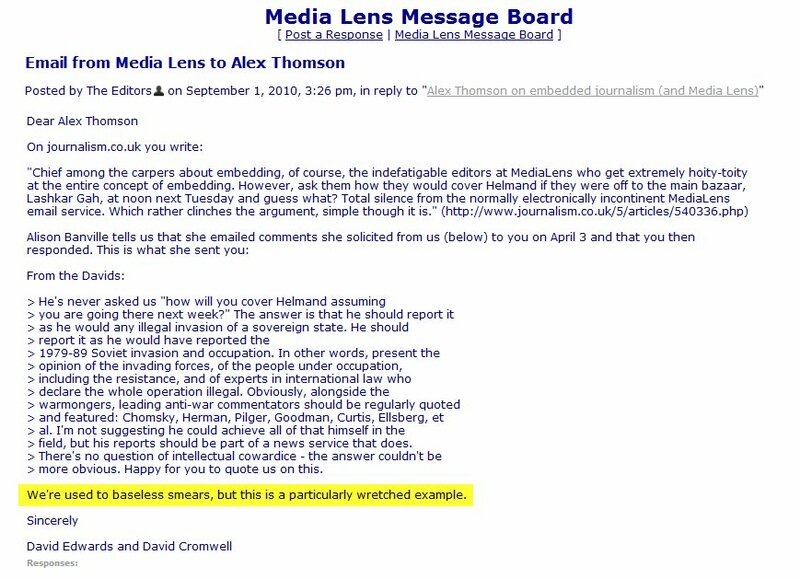 Medialens has “exploited” the frustration that many, many people felt over the media coverage on Iraq by turning it into a campaign against a group they thought they could actually influence. Unfortunately, it seems to have turned into a hate campaign instead, and now Medialens’ giant egos won’t let them correct what they got wrong. I’ve never heard of Medialens but I think I know the type. Thanks for the educational points, the linked post by Shone on Suarez is superb. Medialens practise, on a smaller scale, the very thing they so despise in the media – they marginalise (with various character-discrediting tricks) the “little people” who criticise their actions. They’re a perfect illustration of that Nietzsche saying, “Those who do battle with monsters must take care that they do not thereby become a monster”. The Steven Poole example cited in the above piece is a good one. 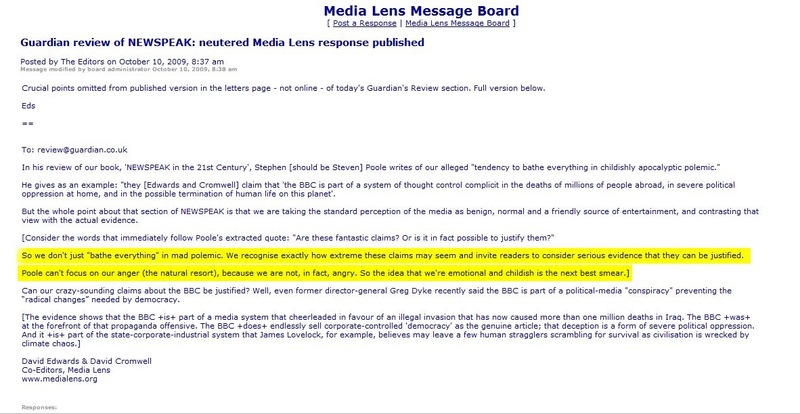 In response to a negative criticism from Poole (he wrote in the Guardian that Medialens write “childishly apocalyptic polemic”), the Medialens editors replied: “Poole can’t focus on our anger… So the idea that we’re emotional and childish is the next best smear”. It’s curious, because Poole doesn’t actually say they’re “emotional” – just that their claims sound childish. Medialens are the ones who like to discredit people by implying they are “emotional” or “angry” – the ad-hom stuff. You can see from another example in the above piece that this is Medialens’s preferred way of dealing with critics such as Shone. (And, incidentally, in dealing with myself. Cromwell recently wrote that I was “upset on Shone’s behalf”. How could he know that I was “upset” [I wasn’t]? Because, in his words, I’d posted “Four tweets within an hour or two” linking to a Shone article. He then went on to insinuate that only Shone could be “upset” on Shone’s behalf, and that therefore I’m actually Shone in disguise! That’s how he responds to serious challenges of his errors and smears of IBC). Well, judging from the thread which contains the post you link to, it appears the Medialens fraternity have a little too much interest in identities and “finding people out”, which doesn’t bode well for an influential future career in radical media analysis, or whatever it is. I agree, you’d think they’d spend more time addressing the matters of substance raised by the znet critique than in playing internet shame-you I-Spy. 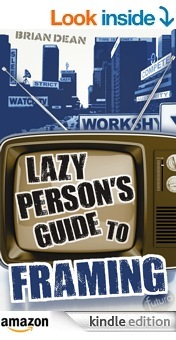 Only just read this (bookmarked it after George Monbiot mentioned it on Twitter). It’s a good article. I’m ashamed to say that I was taken in by the Medialens campaign against IBC for a while. I never got as far as believing that IBC were in league with war criminals (which was the daft claim made on Medialen’s message board), but I did believe the material about an undercount specifically of US/UK-caused deaths. Medialens should definitely correct that, as it’s a very serious allegation. No excuses.